Little by little, the air quality in Erie and Niagara counties continues to improve. For the first time since the American Lung Association began publishing its annual “State of the Air” report, Erie County received an A grade for air quality as it relates to short-term pollution from hazardous soot emitted from vehicles, power plants and fires. The data in the 16th annual report, released Wednesday, covers the three-year period between 2011 and 2013. There were no days where particle air pollution was high in the Buffalo region. The region ranked among the 100 cleanest cities in the nation for short-term particle air quality. “We’re moving in the right direction,” said Michael Seilback, vice president of public policy and communications for the American Lung Association of the Northeast. That’s the good news. Like nationwide trends, Buffalo Niagara’s overall report card was mixed. 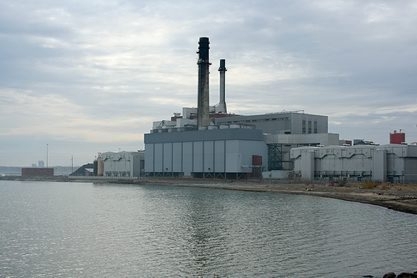 Erin Heaney, director of the Clean Air Coalition of Western New York, credited reduced operations of the coal-powered Huntley electric plant with helping lower the soot count over the last several years. But she cautioned that chemicals like benzene, formaldehyde and other carcinogens are not included in the report. Besides air particles, the lung association’s report shows that levels of ozone pollution for Erie and Niagara counties were only barely acceptable. In that category, both counties received a D rating. Chautauqua County failed again. Ozone pollution is generated by the release of hazardous gases that are usually byproducts of combustion or volatile organic chemicals that react with heat and sunlight to create smog. There were eight days where high ozone was reported in Erie and Niagara counties over the last three years. That’s the same as last year, but higher than the year before. It’s possible the unusually hot summer of 2012 led to the region’s poorer grade in that category in the last two reports. Erie County received a B rating for ozone two years ago for data covering 2009 to 2011. Janice Nolen, the lung association’s assistant vice president for national policy, said weather patterns can affect ozone levels from year to year. Places with higher ozone levels typically have warmer temperatures, more sunshine and fewer days of rain. That’s why climate change impacts air quality, Nolen said. “As temperatures go up, it’s going to make it more conducive to creating ozone,” Nolen said. While it isn’t as lethal as particulate pollution – which can lead to microscopic particles lodging in the lungs – ozone is a lung irritant that results in unhealthy cardiovascular and respiratory stress, especially for the young, elderly and those with asthma. It’s also believed responsible for lower birth weight babies, officials said. In Chautauqua, one of six counties in the state that received a failing grade, there were twice as many days with high ozone in the report – 16 – as in Erie or Niagara counties over the same period. Chautauqua has never received a passing grade for ozone air quality in the 16 years of the study. There could be a few reasons for that. Besides contributions from the coal-fired power plant in Dunkirk, Chautauqua might just be in an unfortunate geographical location. Lung association officials pointed out that U.S. Environmental Protection Agency studies show ozone can travel long distances to affect areas far away from the source of pollution. Pollution in Pittsburgh travels to downstate New York and New York City air pollution affects Connecticut. That’s why air quality is not just a local – or even national – issue, officials said. “We know air pollution doesn’t care about political boundaries,” Seilback said. In all, the lung association data shows, four in 10 Americans are living in unhealthy air. California still ranks at the top for air pollution problems, with the top seven cities for the most year-round soot pollution. But it’s hardly the only place. Nearly 18 million citizens in the U.S. live in areas with unhealthy levels of soot and smog, according to the report. Still, lung association officials remain upbeat about the trends that show efforts to clean the air are working, especially through legislative mandates requiring cleaner energy. Locally, Heaney said continued funding of the state Department of Environmental Conservation and air management programs remain important, along with enforcing regulations and continuing to reduce the levels of air pollutants that industry is lawfully allowed to be released by permit. “Having good air quality is fundamental to having a healthy society and a healthy region,” Heaney said.